Are Wine Ratings Good or Bad, and Are They Necessary? By John ~ November 12th, 2010. Obviously the answer to the above question depends partially on who you are, a wine consumer, a winery, or a wine reviewer. 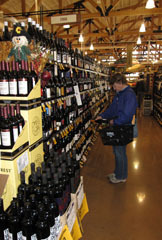 If you are a novice wine consumer, wandering through the wine section of your local Fred Meyer store, how else will you have a clue as to where to start in identifying a good wine to buy? Even if you are an experienced wine lover, how will you find the time or money to taste all of the possibilities in a given varietal without using someone elseâ€™s ratings as a point of reference? If you are a winery owner, you love high ratings because they sell wine, and you try to minimize or ignore lower ones. Most winery owners Iâ€™ve talked to think they are a necessary evil. If you are a wine reviewer, you love wine reviews, especially if youâ€™re getting paid to make them. As you will see if you read our Wine Ratings page, we believe that ratings are a necessity for the wine consumer to be able to consistently make wise and enjoyable purchases. Used properly, we believe ratings are definitely a good thing. And what I mean by â€œused properlyâ€ is that you should find a reviewer whose palate seems comparable to yours because wine ratings are subjective. Make notes of who has highly rated the wines that you really like. Thatâ€™s whose ratings you should follow. Unfortunately, the vast majority of wine reviews and ratings only discuss quality, not value. Here at Wine Peeps, we do both a Quality rating and calculate a QPR (Quality-to-Price Ratio) on each wine that we review in order to help you get the most bang for your buck. Note that I said that QPR is a calculation, not a feeling about value. For more details about our ratings system, visit Wine Ratings. Please leave a comment and let us know what you think of our ratings system and be sure to make us aware of any system that you believe might be even better. We are always looking for ways to improve and want to continue learning along with you. I’ve commented previously on the QPR calculations on this blog on occasion. I understand how they are calculated and see how certain counter-intuitive results often come about. After some discussion, I can appreciate the internal self-consistency of the methodology. Since QPR is defined within a given peer group, perhaps the peer group could be stated for each wine that is rated to help clarify for the reader. QPR is also defined relative to the most expensive wines. Perhaps you might consider looking at it from bottom-up instead of top-down. A 5 out of 5, for example, might be defined as “quality better than 80% of its peers within a given price band” as opposed to anchoring value to the highest prices which can and do fluctuate quite widely primarily due to scarcity, fashion and critical acclaim (i.e. Cali Cults and 1st Growths). Thanks for your comment and your interest in our QPRs. I’ll take a look at your suggestion. I like QPR. I don’t always agree with a wine rating, but I do use it as a yardstick. Being a non-professional, I really do not have an educated palate. I know what I like and what I don’t. I do enjoy producing a bottle that is a 90+ by WA, WS, or WE when I am around friends that do respect the ratings. Especially if it has a great QPR. Thanks. Thanks for your comments, and thanks for reading Wine Peeps. I hope you’ll share our blog with your friends.